For the first time, representatives from Space Exploration Technologies Corp. (SpaceX) – an American space transport company founded by PayPal co-founder Elon Musk – will be among the exhibitors and partners at this weekend’s Rockets 2011 at Willow City on May 5 – 8. 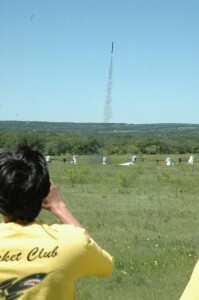 The public is invited to attend the free four-day event and observe students from 50 Texas high schools build and launch 70 rockets up to two miles high and beyond the speed of sound. SpaceX is a private startup that develops, manufactures and launches spacecraft. In December 2010, SpaceX became the first private company to successfully launch, orbit and recover a spacecraft. Two staff members will be on hand to talk about what it is like to work for SpaceX, what the company does, and to help to mentor students in a career path direction. Other exhibitors on site include UT Women in Aerospace Engineering Leadership Development, Kettering University, Texas State Technical College, Hill Country Texas Tech University, Lower Colorado River Authority, Texas State University, and San Antonio Sidewalk Astronomers. At SystemsGo 101, children can build and launch their own kit rocket for a small fee. Food concessions will be available. Sounding rockets will be assembled at a base camp in Willow City, then transported to Camey Stewart’s Hillview Ranch for launching. Signs will be posted, and maps to the site, launch schedule, and complete listings of activities are posted online at www.systemsgo.org. Rockets will go up every 20 minutes between 8:00 a.m. and 5:00 p.m. Thursday through Sunday. SystemsGo is a 501(c)(3) nonprofit organization formed to help spread the program to other high schools in Texas. The goal of SystemsGo is to promote engineering studies and research, develop work force skills, and encourage students to enter academic and career paths in STEM fields that lead to careers in the engineering industries, using project-based activities. SystemsGo is endorsed by NASA and certified by The Space Foundation. Anyone wanting to start a program, to provide support, bring a group, or to learn more about SystemsGo can visit www.systemsgo.org or call 830-997-3567.